Have you ever smelled an unexpected waft of perfume or woodsy scent of pipe tobacco? How about feeling a sudden and unexplained chill in the room? It’s quite probable, according to Wilma Davidson, you’re in the presence of an earthbound spirit – what many refer to as a ghost. In her book, Spirit Rescue: A Simple Guide to Talking With Ghosts and Freeing Earthbound Spirits, Davidson offers practical advice on how to recognize, communicate with, and help these entities – and minimize the fear. Davidson suggests taking the time to find out information about the spirit, including the reason they’ve remained here. They may be lost, afraid, or lonely; or some might have a message they need to pass on. She explains that by “establishing the identity of the spirit, it is easier to guide them to the Light. “You can speak to them mentally or out loud,” she adds, they can hear what you’re saying. Often, earthbound spirits just need help to “realize they are still between worlds.” Most will move on after “receiving a few kind words and some healing energy.” Davidson provides details about how to do this. 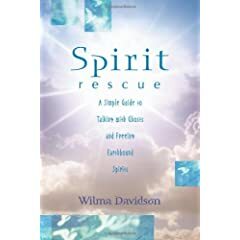 Written in a warm, friendly style, Davidson recounts her own experiences and offers no-nonsense suggestions to “learn as you go along.” Working with spirits, she points out, “requires complete faith in yourself.” She covers a wide range of topics including energy healing, astral traveling, working with angels and other spirit guides, the importance of protection, and even how animals can help with spirit rescue – all designed to help you gain confidence. Reading Spirit Rescue is much like having a conversation over tea with a friend. Davidson provides information, insights, and advice on how to get beyond the fear of spirit contact in order to “guide and encourage them onward.” She offers readers the same kindness, compassion, and reassurance she recommends we offer to spirits. Donna Baker Church is a freelance writer and editor. Donna may be reached at awordchick@yahoo.com . Wilma Davidson (United Kingdom) is an alternative health professional, a Reiki master, a medium, and an expert dowser. She is a member of the National Federation of Spiritual Healers, the British Society of Dowsers, and the Spirit Release Foundation, an organization dedicated to promoting a better understanding of spirit attachment. A popular lecturer, Davidson is frequently in the British media concerning spirits, ghosts, and the unquiet dead. She resides in Dorset.